In his short time serving he has earned the medal of Rifle Master. “It is the highest ranking in rifle skills awarded during basic training,” said Craig. He is Airborne and a parachute rigger. All heroes receive a “Hanging with the Heroes” care package delivered with a personalized “Hanging with the Heroes” t-shirt (donated by Artrageous of Hainesville), a piece of home and letters from Round Lake Area School District 116 students. Tyler’s package will also be filled with candy bars, snacks and cookies thanks to the support of this months sponsor Trustee Judy Armstrong. The Round Lake Area Exchange Club will present a plaque to him and his family on Wednesday, January 23 at 7:30 a.m. at Panera Bread in Round Lake Beach. Any and all military personnel serving overseas or in the USA from any of the Round Lake Areas, Hainesville, Fox Lake or Ingleside qualify for the program. If you have a neighbor, family member, friend, employee, employer, etc. 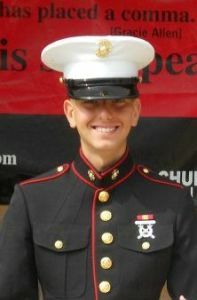 serving in the military please register them by going to www.rlaexchange.org/hero, five minutes is all it takes. We look forward to announcing the February Hometown Hero. For more information visit the web site or you can contact Sherry Ridge at 847-740-2379.